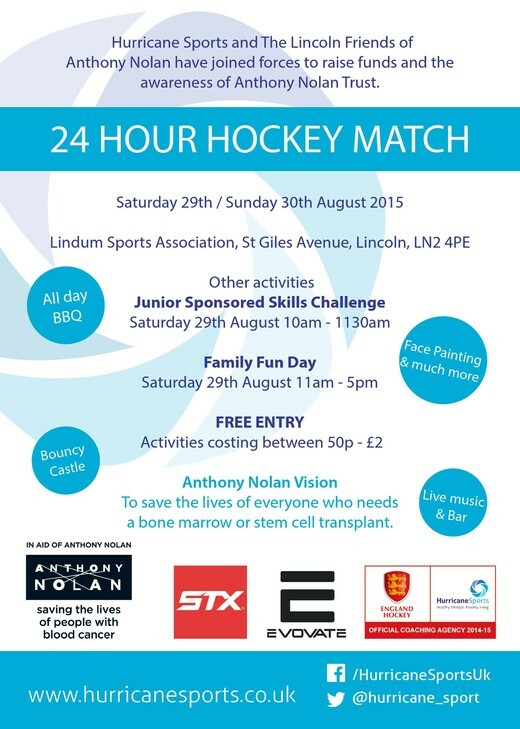 Hurricane Sports are holding a 24 hour long hockey match in August, as a part of the celebrations of the new Lindum Hockey Club, with proceeds going to the Lincoln Friends of Anthony Nolan charity. As well as the 24 hour game there will also be other activities at the Lindum including a Family Fun Day, a Junior Sponsored Skills Challenge and a barbecue and disco. All proceeds will be donated to the Anthony Nolan Trust who work to match donors offering their blood stem cells or bone marrow with people suffering from blood cancer. They were pivotal in helping the family of club member John Sisman a few years ago and the Sisman family now work tirelessly to raise funds for the charity. The following heros are taking part in the game and raising money for a great cause. Please sponsor them if you can. Anyone who would like to take part in the 24 match will need to register, and avail themselves of all further information, on Hurricane Sports’ Website.